At CFA academy we are providing best engineering course training in noida. 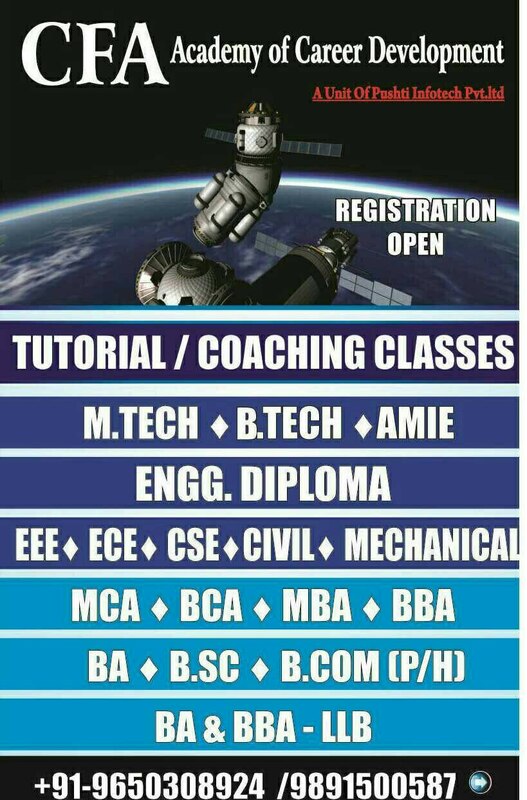 Our aim to give best CA - CPT, IPCC, Final tutorial/Coaching Classes, B.Tech course training, we give best training sessions. CFA Academy is the perfect stop for you as we provide quality education and learning. We offer classes for various courses- B.Tech, BE, AMIE, GATE, MCA, BCA, MBA, BBA, B.Com(P/H), B.Sc., BA, B.Ed, CBSE, SSC-JE and entrance exam training for MCA, CLAT, LLB, Polytechnic and computer programming courses. At CFA Academy we strive to provide the best results when it comes to exam preparation and coaching classes. We have highly trained experienced faculty for computer programming courses like C, C++, JAVA and many more. Enroll now and get free counseling session with a demo class. At CFA Academy we endeavor to give the best results with regards to exam planning and coaching classes. We have profoundly prepared experienced staff for computer programming courses like C, C++, JAVA and some more. Enlist now and get free advising session with a demo class.